The current status of a scrum project can often be checked at one glance. ‘Burn-down charts’, scrum boards with user stories, tasks and columns, indicate whether a user story, for example, is ‘in progress’ or already ‘done’. In general, it can be stated that Agile projects are more transparent; and, thanks to the shorter iterations, the proximity of the stakeholders – via the ‘product owner’ – and the tight collaboration within the scrum team, it becomes easier to re-align the priorities, which allows a quicker reaction time to any type of changes. The quality of the products is better. Every IT pro surely knows the figure with the swing, which shows how the client’s wish is eventually – divergently – realized. Research shows that in traditional environments with originally 100 defined requirements, only 50 are actually realized; and of those 50 only 25 are actually used by the client. That is quite a bit of ‘waste’ according to the ‘Lean’ concepts. 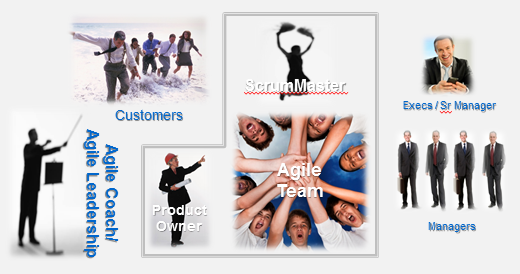 However, in a scrum project, we have the stakeholders in close proximity to the development team. A deviation from the desired product will be quickly ascertained and repaired. Also, if there are new wishes, or wishes which have just expired, quick action can be taken. This would result in the realized product to come very close to the desired product. Another advantage is the fact that the ‘time-to-market’ within an Agile project is often reduced by 10 – 60%. In other words, it’s possible to deliver correct products that are ready for production even faster, in an Agile project. Many times ‘jaded’ IT pros come back to life when they start working on an Agile project. This may be the result of leaving behind the routine ‘drag’ of many years of work or the outcome of working in a team with a common objective, or maybe because the team has a higher degree of responsibility. The fact remains that in Agile projects, the employees usually feel more motivated; they are much happier. This is an emotion, which is not to be underestimated when trying to achieve good results.